fastjet plc is pleased to announce that, as part of its plans to grow its footprint in Sub- Saharan Africa, it has received an Air Service Permit (ASP) from the Ministry of Transport and Infrastructural Development of the Government of Zimbabwe responsible for administering the Civil Aviation Authority of Zimbabwe (CAAZ). 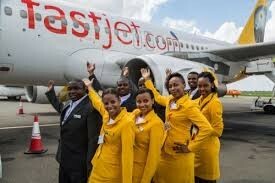 This is a significant step towards the Company obtaining an Air Operating Certificate (AOC) and its plans to launch fastjet Zimbabwe in due course. fastjet has been working with the authorities to obtain the necessary licences over the past few months, the final step being the public “Gazetting” of the application earlier this month. Receiving an ASP means that the Civil Aviation Authority of Zimbabwe and the Ministry of Transport have approved the business plan, aircraft choice and proposed structure of the planned airline as appropriate to operate and compliant with Zimbabwe regulations.